The Nest Cam is designed to help you watch out for your home and family even when you can't. With secure 1080p HD video streaming, advanced night vision, activity alerts, one app for all your Nest products, and an all-new magnetic stand, Nest Cam helps you keep an eye on what matters from anywhere. Set it up in a minute and stream securely. You'll get a 130° wide­-angle view and can zoom in for a closer look. Sign up for Nest Aware so you can go back and see what you missed. 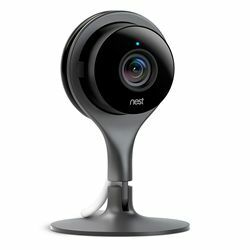 Nest Cam ignores background noise, like the sound of traffic. But will alert you if it hears something that stands out, like a boom, crash or voice of an intruder. Nest Aware service sold separately.